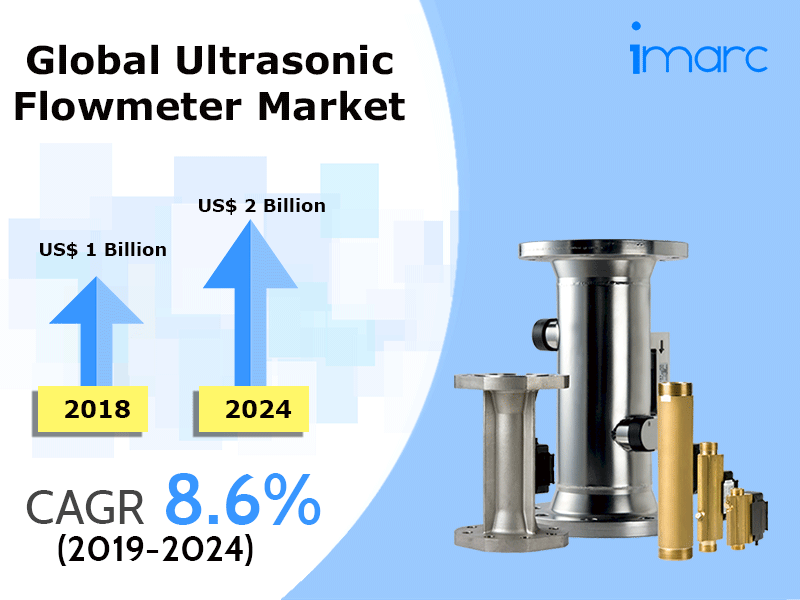 According to the latest report by IMARC Group, titled “Ultrasonic Flowmeter Market: Global Industry Trends, Share, Size, Growth, Opportunity and Forecast 2019-2024”, the global ultrasonic flowmeter market reached a value of more than US$ 1 Billion in 2018. An ultrasonic flowmeter is an instrument which measures the velocity of a gas or liquid flowing through the pipe with the help of ultrasonic transducers. Their principle of operation is dependent upon the speed at which high-frequency sound propagates. These flowmeters are used with corrosive and abrasive liquids as they do not obstruct the flow of liquid passing through the pipelines. As a result, they have gained acceptance in applications where chemical compatibility, and low maintenance and pressure drop are required. In recent years, manufacturers have developed ultrasonic flowmeters incorporated with latest technologies, such as hybrid and portable ultrasonic flowmeters, to improve the accuracy of measurement. Ultrasonic flowmeters are inexpensive, easy to install, and highly accurate and sensitive. They also have bi-directional flow capability, good measurement repeatability, and require less maintenance than conventional meters. Owing to these economic and operational advantages, they are increasingly being used in the water and wastewater treatment to measure the dosage of chemicals, monitor methane discharge, and evaluate large volumes of fluid carrying sludge by-products, suspended solids and other materials. Apart from this, advancements in the ultrasonic technology and computing capabilities have helped in enhancing flowmeter performance and measurement in continuous industrial processes and detecting secondary flow in pipelines. For instance, manufacturers are introducing advanced ultrasonic flowmeters integrated with multi-path ultrasonic sensing capabilities using improved software. Looking forward, the market value is projected to reach nearly US$ 2 Billion by 2024, expanding at a CAGR of 8.6% during 2019-2024. Based on the product type, spool piece is the most popular type of ultrasonic flowmeter across the globe. Other major product types include insertion, clamp-on and others. On the basis of the number of paths, the market has been segregated into 3-path transit time, 4-path transit time, 5-path transit time and 6 or more path transit time. Based on the technology, the market has been segmented into transit time single/dual path, transit time – multipath, doppler and hybrid. On the basis of the distribution channel, the market has been divided into direct sales, independent representatives, distributors and online. The market has also been classified on the basis of application into natural gas, non-petroleum liquid, petroleum liquid, and others. Currently, natural gas represents the largest application segment. Region-wise, Europe enjoys the leading position in the global ultrasonic flowmeter market. Other major regions are North America, Asia Pacific, Middle East and Africa, and Latin America.